The most useful way of accurately measuring change in plant community over time, is by recording the percentage cover of different plant species within several fixed-point quadrats along a transect (see diagram below). 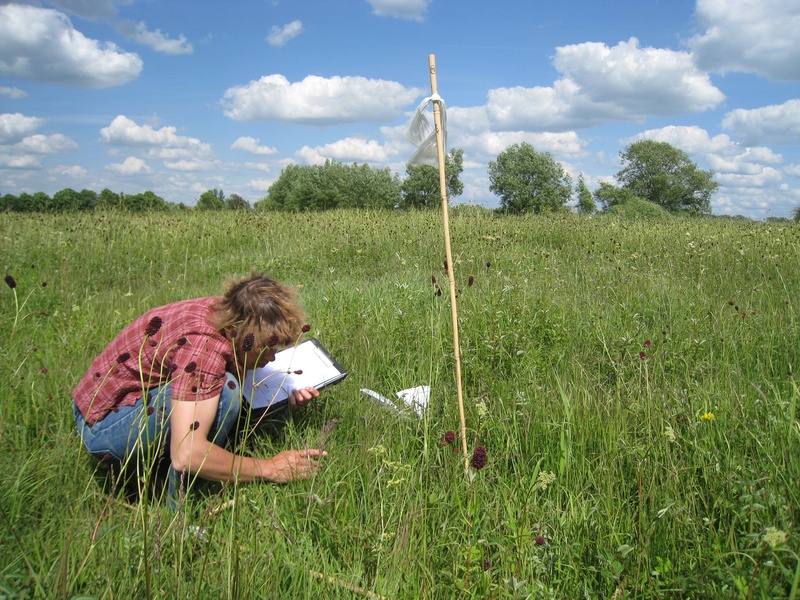 Read an article from the Floodplain Meadows Handbook, about how to set out transect lines. A transect is a fixed line running across the habitat, along which quadrats are placed. A quadrat is a frame used to demarcate a given area, for example one square metre. It may be a fixed frame, or just pegs and a line with string in the corners. Transects are usually laid out along a major environmental gradient, for example running from lower, wetter ground to higher, drier ground. This makes it possible to account for environmental variability often found in floodplain meadow vegetation. Individual species can be targeted for survey if more information about their status and population changes are required. The snakeshead fritillary is an example where a significant population has been surveyed annually by volunteers since 1999. Read more about vegetation monitoring in Chapter 11 of our handbook. Monitoring of both botanical communities and soil-water levels is really important in understanding how your site is changing in response to these parameters. It does not have to be difficult or expensive and can tell you a lot of valuable information. Additionally, if you monitor in a standard way, we can compare your data to the national database. We can then help to put your site into the national context of other similar sites, to see how species-rich it is, whether it is becoming too wet, dry, eutrophicated or under managed. The key hydrological feature to measure with regards to floodplain meadows, is the depth of the water table. This can be done by installing a dipwell or a number of dipwells on a site. They are used to monitor the elevation of the water table and enable the water table to be measured routinely at fixed points within a meadow. If botanical transects have been setup, it is useful to place dipwells along the same transect line. Once installed the dipwells should be left for one month to equilibrate to the water table. Readings can then be taken on a fortnightly basis, measuring the distance between the top of the pipe to the water surface in the well, using a 'buzzing stick' on the end of a measuring tape. These items can be bought or constructed. A hydrotool (at the bottom of this page) can be used to interpret your own hydrological and plant data. Please contact us for more monitoring advice and guidance, or see if there is a local floodplain meadows ambassador in your area? Soil characteristics vary with depth, especially in a soil with clearly defined horizons and fluctuating water table depth. The most usual technique for soil sampling, is to remove the litter layer to expose the top of the soil, and then to extract the first 10 cm of soil below the surface by using a soil corer, although a trowel can also be used. Soil structure and texture can also be investigated using the following soil key.